The White-browed Robin-Chat is a Southern African bird that belongs to the Muscicapidae bird family group which includes birds such as Thrushes, Robins, Chats, Old World Flycatchers. The description for the White-browed Robin-Chat (Latin name Cossypha heuglini) can be found in the 7th Edition of the Roberts Birds of Southern Africa. The Cossypha heuglini can be quickly identified by its unique Roberts identification number of 599 and the detailed description of this bird is on page 931. You will find a picture of the White-browed Robin-Chat on page 960. NOTE: The reference for the information following is "Roberts Birds of Southern Africa", 7th Edition*. This edition contained a number of taxonomic changes as well as changes to English names used traditionally and in earlier editions of most bird books in South Africa. The following paragraph notes such changes if any. This bird is known as Heuglin's Robin in the Roberts 6th Edition. There have been no changes in the Latin name for the White-browed Robin-Chat between the Roberts 6th and Roberts 7th Edition. The White-browed Robin-Chat is known in Afrikaans as Heuglinse Janfrederik. The White-browed Robin-Chat has a height of 20 cms and weighs around 38 gms. The head is coloured white, black while the bill is coloured black. The Cossypha heuglini has a grey coloured throat, black legs and a brown coloured back. The eyes are brown. Take note of the bird's main distinguishing features such as colour, size and leg length relative to the body size of the bird. Colours of a bird's body parts can be helpful. Be aware what may appear brown to one person is described in Roberts Birds using some other word ... for example brown, black. See colours used in Roberts. This bird forages for food on the ground. The White-browed Robin-Chat is usually seen hunting for food within the tree foliage. This bird eats insects such as butterflies, bees, wasps, locusts and ants. These invertebrates are usually hawked aerially, killed and then eaten. The White-browed Robin-Chat is a monogamous bird which means that the bird finds and breeds with one partner for the rest of its life. The bird lays between 2 to 3 eggs and they are coloured brown. The nest is built high up in the tree canopy and is protected from predators by branches and the dense green foliage. 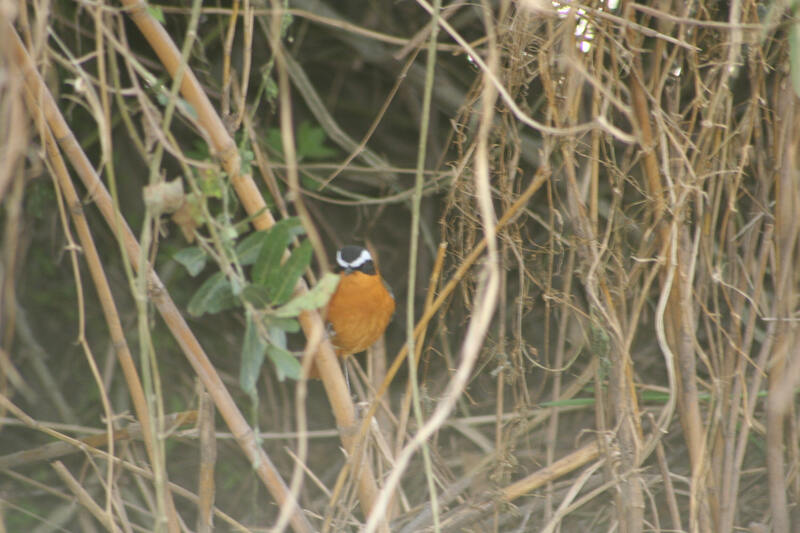 The White-browed Robin-Chat is mainly found in light and densely wooded forests, where there are Mopane trees. The bird is found in the African bushveld. The bird is at home in riverine forests and close to water bodies such as lakes, dams and streams. This bird is very common in most of the Southern African Forests. The bird is an urban dweller as well, being at home in parks, gardens and in old vacated buildings. The Whitebrowed (Heuglin's) Robin Chat is normally seen singly or in pairs.